it’s no secret that my favorite color is pink, and so I am so excited today to share with you My Sister’s Closet Boutique and their mantra “Be Pink”. Pink is known as being a happy, loving, peaceful and sweet color. It represents friendship and approachability. those who know me personally know I’m really obsessed with pink 😉 from wanting everything in my wardrobe to be pink, to the fact that (almost) every single room in my house has something pink in it. “Pink” is even part of my license plate 😉 shh! that’s our secret! My husband doesn’t understand why I would ever want a pink front door 😉 so I’ve lost that battle, but that doesn’t mean I can’t have a pink wreath! or pink flowers lining our home. Pink to me, is everything. If I could describe my personality in a color, it’d have to be .. what’d’ya know?? .. 🙂 pink. Pink is fun and girly, it is soft and sweet. Pink is pretty and feminine. Pink is the kind of woman I want to be. I want to be known for being a great friend, for being approachable, for being sweet and kind. I want to be that “pink” woman. the one who is generous, and gives service. the woman that loves her family, and her friends and shows it, and importantly, I want to be a woman that loves herself. Pink also represents a love for oneself. to “Be Pink” for me, means that I can be confident and be my best self. and be proud of who I am, and what I like. wearing the color pink gives me that confidence 🙂 I think that’s why I love pink lipstick so much 😉 there’s a wide array of pink shades too, so really there is an option for everyone! 🙂 and I know there are ladies that don’t necessarily love the ‘color’ pink, but let’s embody what pink means and Be Pink together! this adorable stretch skirt I paired with a floral blouse to accent the bright pink, and a simple sandal was the perfect match for the first day of spring! (I wore this Sunday). I love how bright this skirt is and because it’s textured, I feel more comfortable in it even though it’s fitted – and the price! AMAZING! 😉 you won’t believe it. 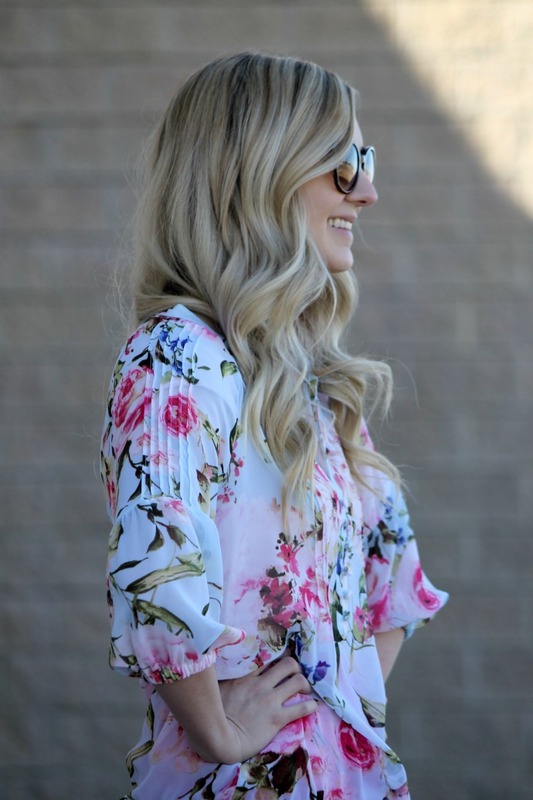 I typically choose lighter shades but felt this fuschia was the perfect piece for this spring and summer! What does “Be Pink” mean to you? .black and gray // date night. .albion .. matching with my girl. Previous Post .this valley girl. Next Post .denim has me grounded.